After 10 years and 20k miles later, the VW engine had to go. Although it did still run, it was time for more power. I chose to stick with the flat four engine and went with a Subaru four cylinder engine. This page will document my transformation from an air cooled to liquid cooled engine. 11,12-Sep-2004: NCKCC car show. Painfully, my car missed another show because it was not running. Great show this year. The turn out was great. 10-Sep-2004: Last day before the show and the engine is still not in the car. Hope for making the show this year is very low. I was able to get the clutch on and bolt the engine to the car. I like how good the engine looks in the engine bay. I weighed both the old VW and Subaru engines dry. 06-Sep-2004: I felt better this morning. After two days of not sleeping well due to the heat, I took everything slow today. With the help of my trusty Dremal tool and a cut off disk, I was able to convince the transmission mounts to make space for the adapter bolts. I should go back and clean up my cuts, but an worried about getting the car running for the show. 05-Sep-2004: Today I hurt myself. I woke up late and went directly to the car, with out eating or drinking any water. By noon, it was over 100 and I was out. I had to stop working on the car, get water and lay down. I know better than this. I wasted a day, when I could not afford to do so. I spent the rest of the day in bed trying to drink water. 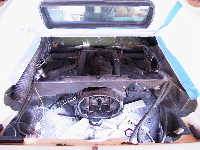 04-Sep-2004: I had hoped to get the engine in today. The bolts on the adapter lined up 100%, but knowing KEP I was not surprised. The bottom two adapter bolts hit the transmission mounts. I knew that they would hit the mounts. I will have to cut some space in the mounts later. I can say that it was nice to see the engine in the car. I was also really happy to see how natural the Subaru engine fit in the engine bay. 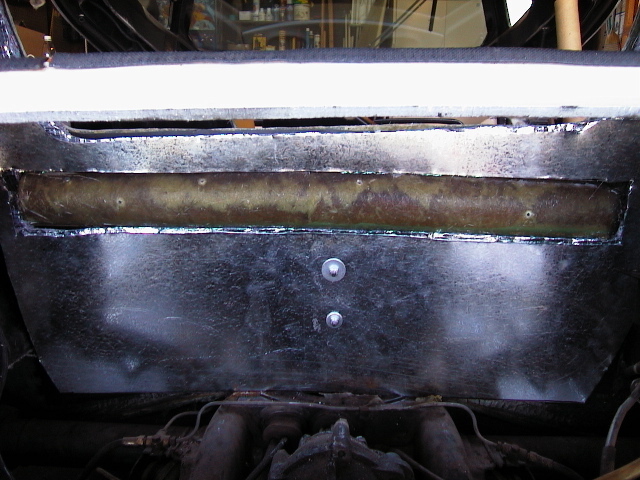 I then started on finishing the fuel cell brackets. After some tinkering, I found that it would be easier to mount the fuel cell off center. By move the the cell an inch to the left side I could use a vertical bracket for the left side and make only one angle bracket for the right side. I then build a mock bracket for the right hand side. Now all that I have to do is have the bracket welded. Next was to start the fuel lines. I installed the fuel filter and cut the fuel lines from the fuel cell all the way though to the engine. It was over 94 today and the heat really slowed me down. It is going to be hot all weekend and I do not know how well I am going to hold up. 22-Aug-2004: I hit the wiring loom hard today. I would say that I am 90% done. All that is left is to straighten out the wires and start wrapping. The second project for the day was the fuel cell holding bracket. Luckily my Dad dropped by and made a couple of templates out of cardboard. What we found out, was that this is going to be a tight fit. 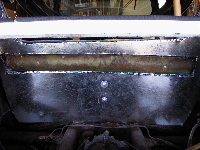 The starter is also touching the fuel cell and there is now good place to put fuel intake. The fuel cell sits right below the rear window tunnel. I will have to install a remote filler or cut a whole into the tunnel. 21-Aug-2004: Big car weekend for me. Today I finished installing the firewall. Next on the list was to hit the junk yard to get a fuel pump. A fellow Sterling owner had the idea of using the stock Subaru fuel pump. (Jenny you rock) What a great idea this turned out to be. The fuel pump fit the fuel cell almost perfectly. After a little bending, it went right in. At the junk yard, I found that the fuel filter holder for the stock Legacy would be perfect for the Sterling. 17-Aug-2004: I ditched work today to work on the car. My plan for the day is to clean the engine, clean up the work area and finish the wire harness. I cleaned the engine and started on the work area. Did I mention that I broke the alternator trying to take it apart? Oh, I did. Off to the junk yard I went. The fuel cell also arrived today. 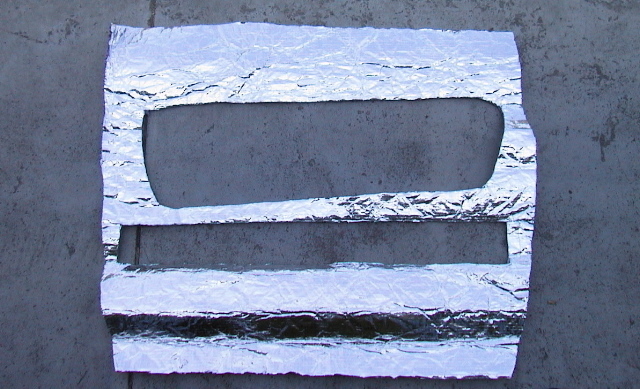 10-Aug-2004: Template for metal firewall made. 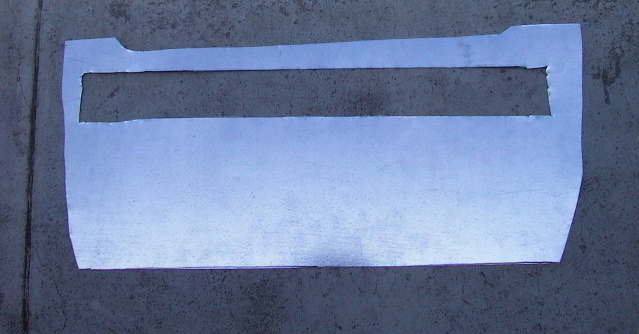 Next is to give the template to Chuck to have him cut out a metal fire blocker. I told him that I need something thick enough to stop a fire just long enough for me to get out of the car. 09-Aug-2004: I started the firewall today. 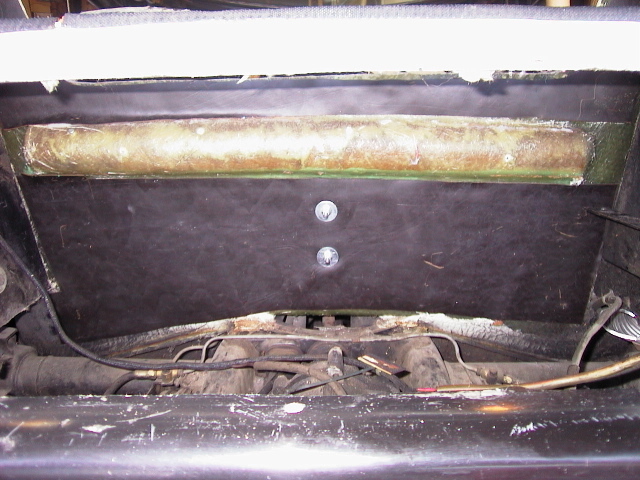 This was mainly cleaning the firewall area and installing sound deadening material. I used the asphalt based sound material. Just the little bit make a difference in the tap test. Hopefully the car is not going to be as loud as it use to be. My goal is to be able to talk to my wife with out yelling over the road and engine noise. 08-Aug-2004: Since the wire harness I got with the motor was cut up a lot, we went to the junk yard to pull a new one. Three hours in the sun later, we have an uncut wire harness. My dad and I baked under the sun. I can say that it was fun to rip a part a dash with no care. After we got home, we started laying out the wire loom to the sheet from KEP. I have a long way to go. 25-Jul-2004: The old rusting 10.5 gallon gas tank came out today. I had to cut out the fiberglass above the tank and wiggle it out. Next, I built a cardboard box the size of a 12 gallon fuel cell and test mounted it. Good news finally, it fit. It also looks like I can reuse the S/W fuel sender again. 13-Jul-2004: I took a day off from work to hit the car. Today's plan is to install the clutch, and start on the wiring. The clutch just bolted in with no issue. Next was to start on the wiring. I left the engine wiring alone and started on the engine to ECM wires. This is nasty stuff. I have been reading about how much work the wiring is going to be, but I did not understand it. 11-Jul-2004: Now that my job has let me out of the office for more than 6 hours, I can get back to the car. I spent most of the day prepping the EJ22. The KEP engine adapter is now installed. I know that the directions from KEP did not specify using liquid gasket between the adapter and the engine, I used some just to make me feel better. Next on the list for the day was to remove the old starter and install the new high torque one. One little issue showed up...the shinny new starter does not fit. It hits the gas tank. This brings me back the the thought "Nothing comes easy with this car." I now have to add a new gas tank to the list of parts to buy. Deep down inside and wanted a new fuel cell and was looking for a good excuse to buy one. Now I have that excuse. 12-Jun-2004: After a long spell of not working on the car, I got some time today. I set up the life size print out of the electrical from KEP. I found a piece of plywood, and stapled it down. Next I will start laying out the wires. 18-Mar-2004: The engine adapter from KEP arrived today. The only part missing now is the oil pan which is on back order. I'm not too worried about the back order status. KEP has been wonderful to deal with and my work schedule is going to be ugly until April. I expect I will not touch the car for two weeks now. 06-Mar-2004: KEP delivers wire diagram via mail. 01-Mar-2004: I purchased two 12" 1050cfm electric radiator fans off of eBay. They measure 11.78" X 12.25" X 2.35" and pull 8.5amps. I am going to run either 8 or 10 gauge wire to run these. Luckily I have plenty of wire laying around. 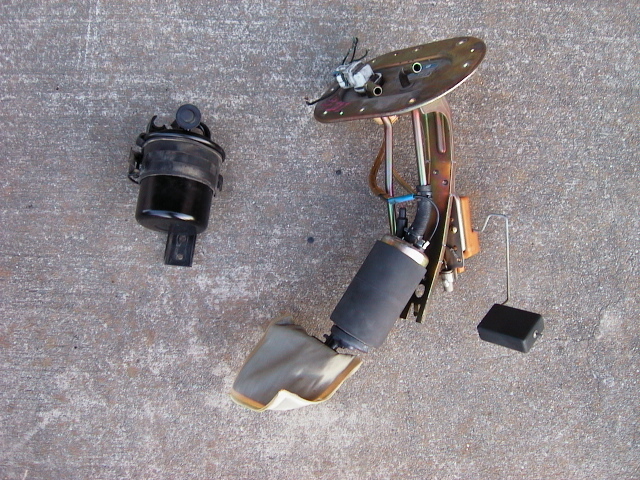 01-Mar-2004: Mailed in oil pan and a check to KEP. 24-Feb-2004: With the help of Dad, the VW engine was pulled. We also built and engine stand for the EJ22. 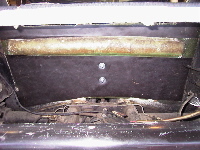 07-Feb-2004: Went to Pick-n-Pull and found the smallest aluminum radiators I could find. 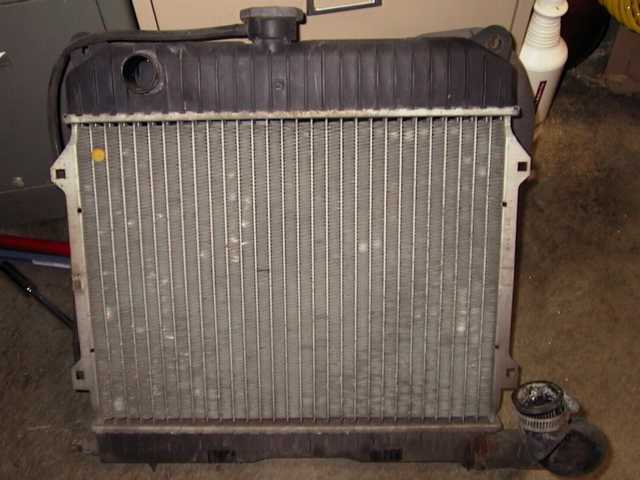 I found that the late 80s BMW 320s had an aluminum radiator with the dimensions of . I picked up two. 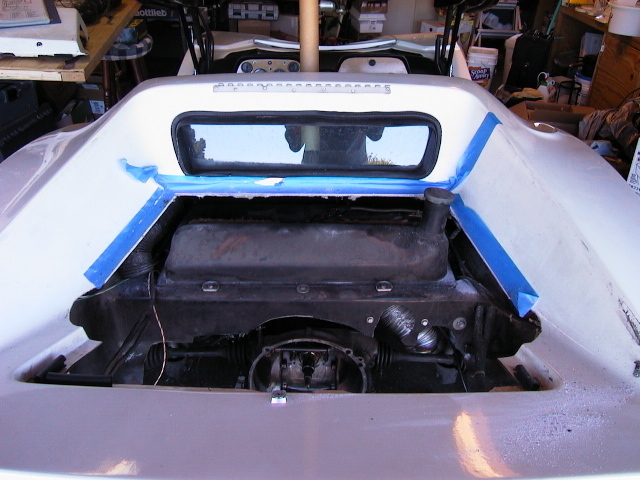 10-Jan-2004: Picked up the EJ22 engine. The seller, Al, lives 20 minutes from my house. My car was in for it's 60k mile service, and since Subaru of Santa Cruz rocks, I had a free rental Outback. I thought it fitting that I was picking up a 91 Legacy engine in a 2004 Legacy. Al was great. Besides just being a good guy, he was really helpful and pulled the engine to my specification. (aka cut no wires!!!) It turned out to be heaver than I thought. We were able to pick up the engine, but I do not think that we could of carried it too far. The only downside was the plastic timing belt cover was busted and it was missing a spark plug wire. When I returned the rental to the dealership, I purchased the timing belt cover and a set of spark plug wires. 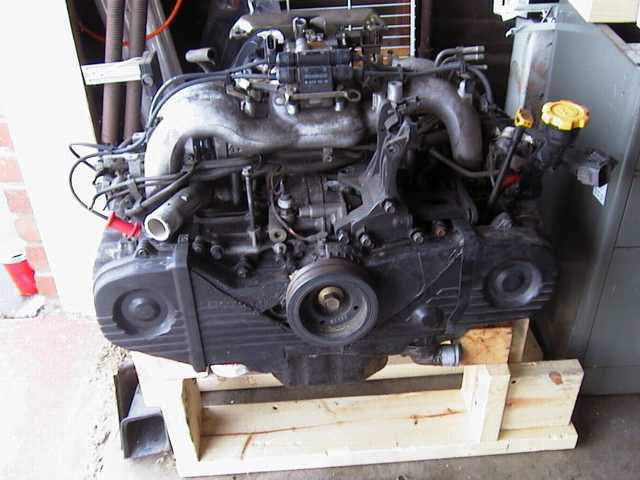 02-Jan-2004: Today I purchased a 1991 Subaru EJ22 engine off of eBay. The engine has over 100k miles, but is complete. The car is going to feel a whole bunch better with this 130hp powerplant. I cannot wait to start the installation.